ana tomy is a fresh, forward-looking custom notebook stationery brand founded on the principle of self-expression. They sell custom notebook to encourage creativity through written media and have set themselves apart from the crowd by providing customized stationery. ana tomy notebooks, however are more than just stationery. They are individually designed and produced using contemporary technology, informed by established practices. They focus on making available the best materials with which they create highly quality merchandise, leaving the design aspect to the customer. By offering a unique buying process, which includes personalization, customers have endless choices resulting in tailor made, bespoke items.Consumers are always on the lookout for unique products. According to a Deloitte consumer review, one in three customers want personalizations and are willing to pay a premium for it. No wonder that the idea of custom notebook caught on and soon gained traction. 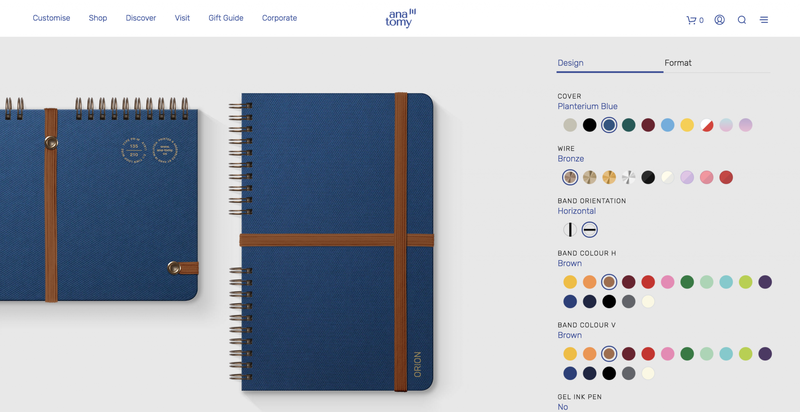 After having achieved considerable success in their retail custom notebook store, ana tomy decided to replicate their success by reaching a wider target audience online. How the ana tomy WooCommerce based custom notebook store works? What were the motivating factors behind your decision to use the Visual Product Configurator for WooCommerce? We hoped to accurately convey the customization experience from our physical retail store and implement it on our online store. I was toying with the idea of building our custom notebook from scratch with applications that carry the basic functions we needed. I saw the Visual Product Configurator as a good start for us to achieve this, after trying out the demos and perusing some related websites. I took into consideration the helpful support from the author (and the team), I therefore decided to work with them for further adjustments and customization to achieve the experience we needed. What has your experience been since taking that step? It was great. I started with visualizing the customization flow and the shopping experience on our website. I shared my thoughts with the visual product configurator team to get some input on the do’s and don’ts. We then moved forward with my concerns and the things I was hoping to achieve with customization via the visual product configurator. From start to finish, the VPC team was incredibly helpful throughout this entire process. How have your customers responded to the availability of this function on your website? Since the site was launched I received tons of positive feedback on our custom notebook. Our customers are now able to visualise the design combinations through our website before placing the order. Not only is it fun to receive positive feedback, it is really motivating too. How has using a Visual Product Configurator enhanced / changed your company’s value proposition? We celebrate diversity and encourage individuality. That is why we believe in a personalized future. With a helping hand from a visual product configurator, we were able to bring the ability to customize notebook from our retail store to our online store. Visualizing and personalizing a notebook is now made easier and more accessible to our customers.ana tomy is a great example of a business who, to their customers’ delight, successfully uses product customization and personalization as the foundation of their business model. They offer bespoke products to a market hungry to show off their individuality.Do you have any questions or contribution? We will be glad to know! Tell us in the comment box below!